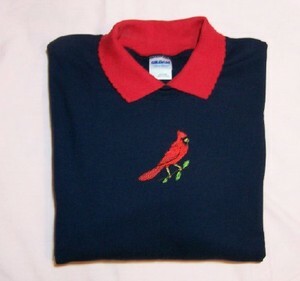 This navy blue sweatshirt is embellished with a beautiful embroidered cardinal. It has a knit pointelle red collar and is totally washable. This is a Gildan ultra blend sweatshirt 50% cotton and 50% polyester. For the person who loves cardinals, this would be a wonderful gift. Or, buy it for yourself! !